Garden2Table: Garden2Table and the "Real Food Movement"
On November 10th, Garden2Table teamed up with Hellmann's Canada to host an extraordinary afternoon dedicated solely to FOOD! 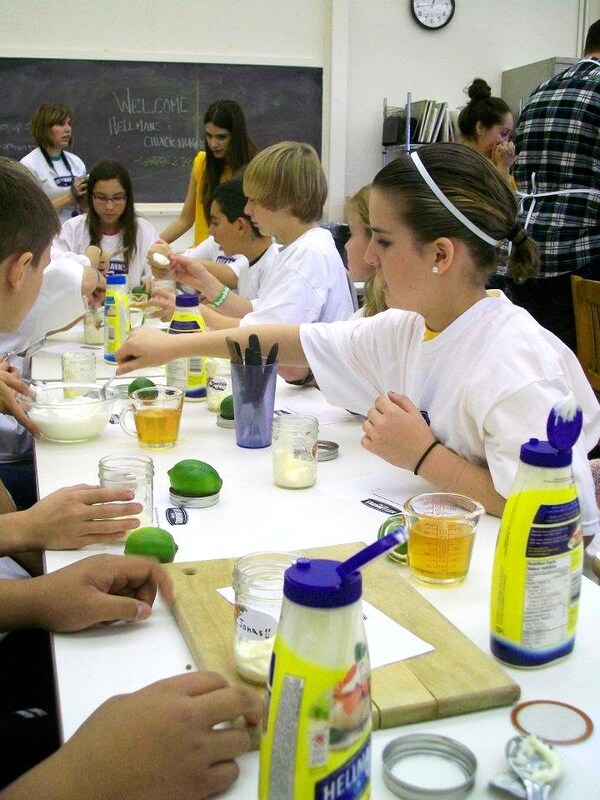 G2T recently received a grant of $10,000 from Hellmann's, coinciding with their "Real Food Movement" on teaching children and their families about eating healthy, homemade foods. Having already visited the Guelph Center for Urban Organic Farming this fall, St.Ignatius of Loyola's class of eager grade sevens was finally able to take what they had learned from the garden... to the table! With help from celebrity Chef Chuck Huges (winner of Iron Chef Canada, host of The Food Network's t.v. show, "Chuck's Day Off", and owner of several Montreal restaurants), the students were able to enjoy preparing and sharing a four course meal at the MacDonald Institute's kitchen facility at the University of Guelph. 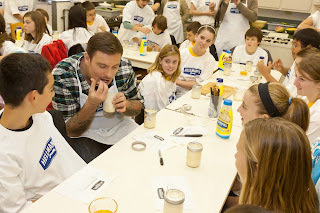 Beginning with a Hellmann's recipe for salad dressing, each student was able to measure the ingredients and assemble their very own "take-home" mason jar to share with their friends and family. Next, everyone broke into groups to prepare more items such as the Hellmann's Grilled Cheese and spicy dipping sauce, a fresh watermelon and beat salad with ingredients straight from the garden, and delicious nut-free granola bars for dessert. After a lot of hustle and bustle, laughter and occasional sneaking of chocolate chips, everyone sat down communally to enjoy the wonderful meal they had worked so hard to prepare. The afternoon was a fantastic way for the students to cook and taste real food. Some of the students even shared that they had never cooked anything on their own before, but are now motivated and excited to try! Thank you to all of the volunteers that came to help cook that day including parents, teachers and students. And thank you to Hellmann's for helping make the day such a success!